Or view larger version. Untitled. 1909. Edward. H. Mitchell. Postcard of a color drawing. Collection of Oakland Museum of California. Gift of Dorothy Bennett. 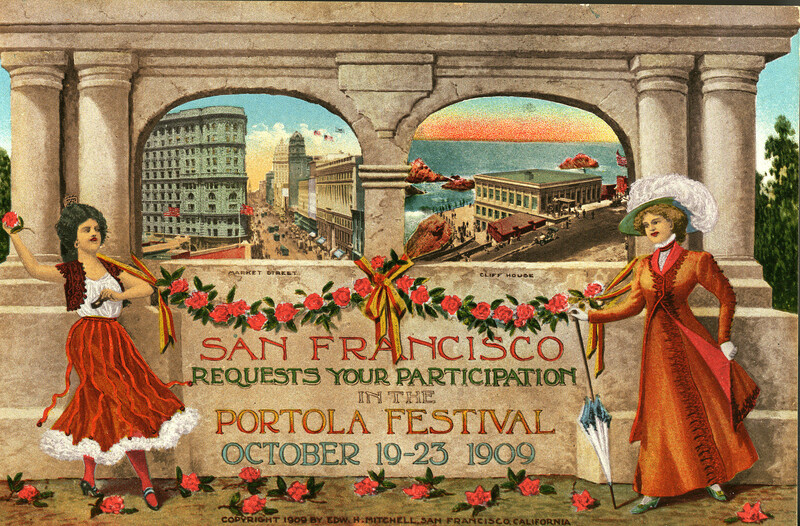 This postcard is an advertisement for the Portola Festival in San Francisco, California from October 19 through October 23, 1909. The festival was used to demonstrate to the world that San Francisco was an exciting destination. The strategy was to provide confidence to businesses so that the city was seen as a place that could handle every commercial challenge.